The Happy Homebodies: I Won! I Won! I WON! Lowe's is having its Facebook Last Minute Gift-a-Thon this weekend (now through Sunday), and I was one of 200 lucky people who got the 90% off coupon for the Kitchen Aid Stand Mixer! Thousands of people were trying for it–which quickly crashed the server– but I got one before the server went down. I'm so pumped! 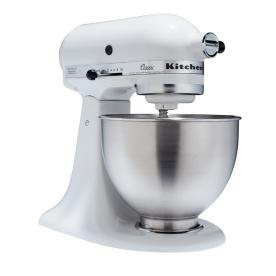 This awesome mixer has already been purchased online and is waiting for me at my local Lowe's store. The total with tax came out to $15.67! This gift-a-thon is going on all weekend, and they are also giving 90% off coupons for a Dyson animal, a food processor, a Dremel and more. Here is the preview. To join the party, you have to "like" Lowe's on Facebook and click to attend the party under "Events."